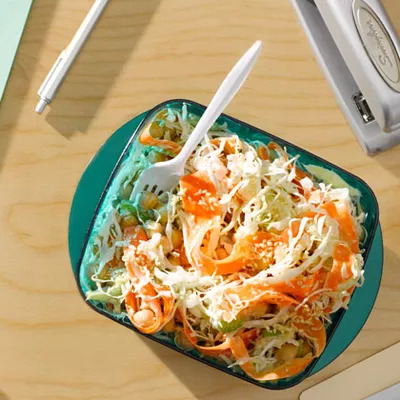 This vegetarian recipe combines shredded cabbage, celery, and carrots with yogurt, cider vinegar, chickpeas, and sesame seeds. It's simple to make and dishes out 15 grams of fiber and 18 grams of protein, most of it from the chickpeas--a great source of vegetarian protein. To make this tasty recipe, simply stir together fat-free yogurt, vinegar, water, salt, and pepper. Then add in canned chickpeas, sliced green cabbage, celery, and carrots. Toss to combine, and sprinkle sesame seeds over the top. Prep time: Just 10 minutes. However, you should refrigerate the slaw for at least 4 hours before eating. The good news is that this dish stays fresh in the fridge for three days, making it a great make-ahead dish for a party. Ingredients: cabbage, celery, carrots, fat-free plain yogurt, cider vinegar, chickpeas, water, sesame seeds, kosher salt, black pepper.